Good morning folks! Have you heard of the brand I Love Nail Polish? 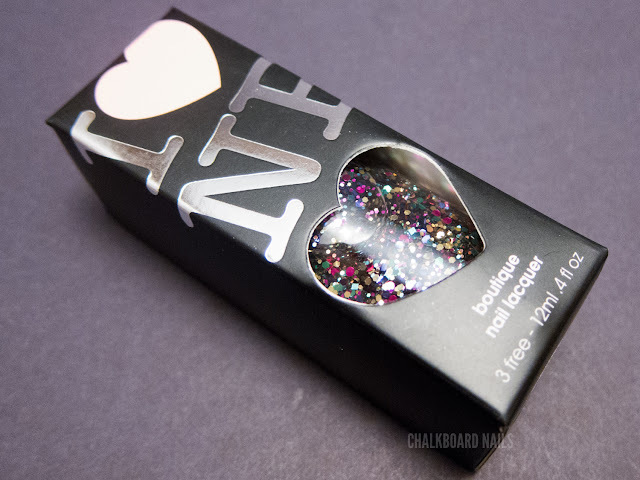 It is sometimes shown as I <3 NP or I <3 Nail Polish. Today I'm sharing the I Love Nail Polish Winter Collection. Christmas in Bordeaux is a fine glitter topper made up of red, green, and gold glitters. There are also some irregular goldish flakes, which you can probably see best on my middle finger. 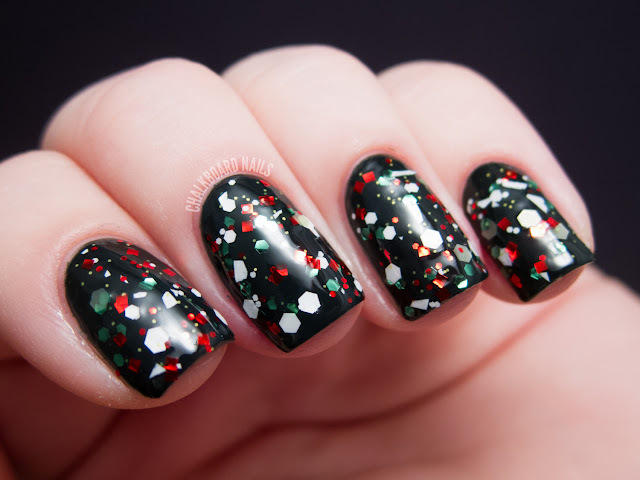 It was designed to be a refined Christmas glitter, and I think it definitely achieves that. I've shown one coat here over American Apparel Office. Ginger Spice Latte is a copper and gold glitter mix in a clear base. It's fairly dense; you can see one coat below over Essie Yogaga. The polish in combination with its name definitely feels "spicy" to me, like I should be snacking on gingerbread cookies and cider. The glitters in this are small, so it isn't too in-your-face, but it does add a bit of warm sparkle to an otherwise plain manicure. 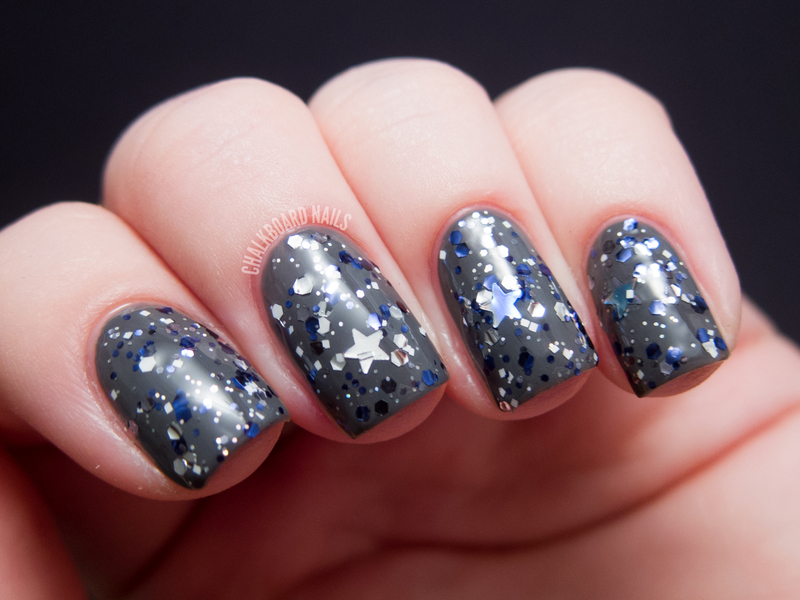 Once Upon a Starry Night is a glittery topcoat made up of dark blue and silver glitters, with star confetti glitters! The stars seemed small enough to work on my curvy nails which is a huge positive for me, and they were plentiful. I love the colors in this mix. Once Upon a Starry Night is shown here over American Apparel 7th and Alameda. Something About Merry is a chunkier Christmas mix of green, red, and whites. In addition to the metallic greens, there are also translucent green glitters that make this one unique. I also love the red squares. I've shown it here over Essie Stylenomics. Up to Snow Good is a tealy topper made of primarily white, translucent white, teal and aqua glitters. Again, I am loving the squares here, as well as the irregularly shaped white pieces. I've layered it over China Glaze Elephant Walk. Babes In Toyland is a fun multicolor topper made of fuchsia, sea green, teal, and gold. The best part about this polish, in my opinion, is the inclusion of the small fuchsia circle glitters. I've not seen polish with circle glitters of this size; they are a really awesome and cute. I've shown it here layered over OPI Don't Touch My Tutu. Of course, you guys know I had to add another layer of DTMTT over the glitter to see how Babes In Toyland looked sandwiched. I was particularly impressed by the professionalism of this brand. Each polish comes in a gorgeous box (as shown below) and the polish labels, both front and bottom, are nicely designed and pleasing to the eye. The bottles feel hefty and the caps are rubberized. Each polish is 12ml and 3-free, though I should mention that they do smell a little different than most of the indies I've tried. Not better or worse, just different. Overall I am really excited about this brand! I love the names of these polishes, and like I said above I was very impressed with the overall experience, including polish, packaging, application, presentation, etc. You can buy I Love Nail Polish lacquers on Etsy. You can also find the brand on Facebook and on the I Love Nail Polish blog. 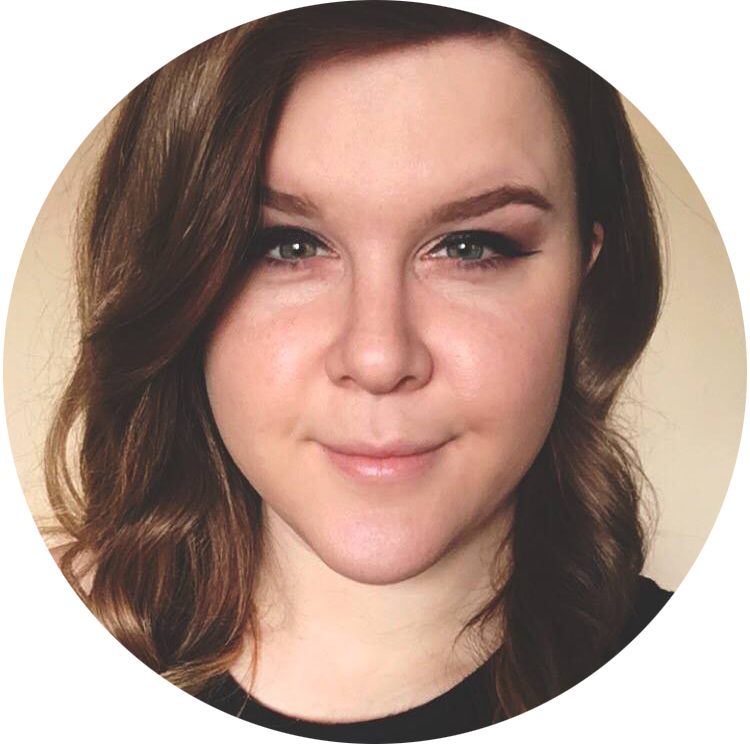 Wow what a professional looking indie brand. And I really love how you layered all of these, and the makers choice of mixing glitter shapes! love the packaging!! putting up to snow good & babes in toyland on my wish list! I just bought my first I Love Nail Polish in Turqued the other day. Can't wait to receive it! Something About Merry has to be my favorite! It looks so amazing. Upon a Starry Night and Ginger Spiced Latte are so lovely. And Something About Merry is just so christmassy! I'd love it if you could show some bottle shots! I am always curious about indie brands like this, and judging by that box, I'll love the bottle! Can't say I blame you there! Love the Ginger Spice Latte in particular. And as always, your manicures are impeccable! Thank you! I like that one a lot too. Yes, I ordered the top 2 and I can't wait for them to arrive ♥. I LOVE them all !! they look great on you ! You've layered these over the perfect colors. Makes them look so pretty!! I really love the sandwich! I really want babes in toy land, ginger spice latte and opi don't touch my tutu! gorgeous! I really love the first combo! Ginger Spice Latte is very pretty! My favorite of the bunch! I love Christmas In Bordeaux, it looks like the perfect Christmas glitter! I think I need to try more glitter sandwiches. I love yours especially. Oh, I forgot to say I <3 Nail Polish always has fab photos on their Facebook. I've been following them for a while to look at the photos, and then they started coming out with pretty polishes. Round Glitter = instant obsession! Love the sandwich! I really like Once Upon a Starry Night as it does not look like a Christmas polish. I don't celebrate Christmas! Hi Rochelle, I just replied to you! Wow, these are BEAUTIFUL! Christmas in Bordeaux and Ginger Spice Latter are my faves! Thank you to everyone for your wonderful comments and a SUPER HUGE thank you to Sarah for swatching my polishes!! Is there a single one of these not going on my wish list? Nope! What a great collection!